New to Cornerstone? Come and enjoy a delicious free dinner on us and meet our pastors! Let us know if you are coming by filling out the fields below. If are interested in becoming a member of Cornerstone join us on August 15 at 6:30pm. Sign up below. This is a 50’s themed interactive dinner theater. Bring the whole family and join us for our annual End of Summer BBQ! Bring a desert to share. Interested in becoming a member at Cornerstone? Come to our membership class to learn about what being a member at Cornerstone means. Fresh Start is a class for new believers or anyone interested in learning more about their faith. If you are interested in being baptized please sign up below. Celebrate Recovery will be hosting a movie event for the whole family. Free Hotdogs, popcorn, and drinks. For 2.7 million children in the U.S., that story may be filled with the abandonment, loneliness, and shame that come from having a mom or dad in prison. For many, it may also include following their parents down the same destructive road to incarceration. Angel Tree®, a program of Prison Fellowship, reaches out to the children of prisoners and their families with the love of Christ. This unique program gives you an opportunity to share God's love by helping to meet the physical, emotional, and spiritual needs of the families of prisoners. This event is for kids 12 and under. It is Disneyland themed. We will have characters, games, and candy. Event is free. This is a small group for married couples who want God's perfect design for their marriage. Some of the topics we will discuss are communication, conflict, and real intimacy. Don’t wait until something big happens to talk to your kids — start now! In Talk Now and Later, author Brian Dollar presents 10 common topics your child deals with — or will soon — and detailed advice on how to approach and discuss the issues with them. Learn to have these conversations early, have them often, and have them wisely so that when the difficult topics come up, the lines of communication will already be open. Get ready to talk to your children about the big issues in life — now and later. Join us for our 5th annual End of Summer BBQ Wednesday August 16 @ 6:30pm. It will be a night full of fun for the whole family. Enjoy barbecue tri-tip sandwiches with yummy side dishes. 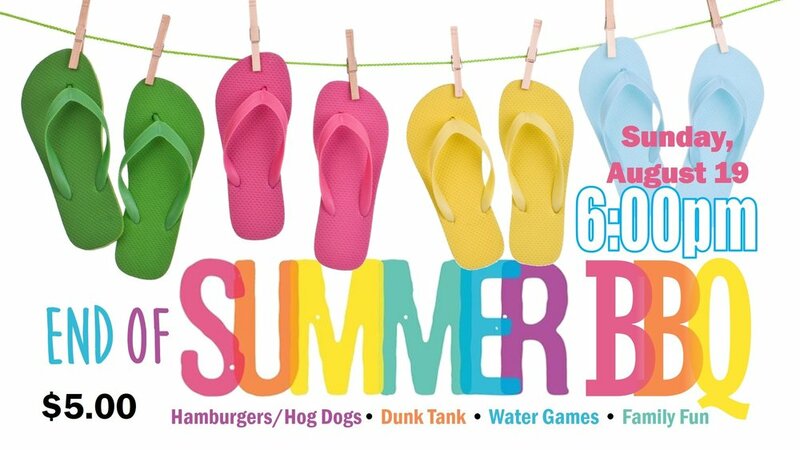 There will be lots of games for the kids, including a giant water slide and a dunk tank. You can also enter our annual Pie Bake-Off contest and win great prizes. Don't miss out on the fun! Want to enter a pie for the Bake-Off? Click HERE to Enter a Pie! All men are welcome! We will be meeting at Red Robin in Manteca at 12:30pm. "Connecting Hearts" is a new ministry at Cornerstone focused on fostering and adoptive families. We will be having a BBQ to introduce the ministry and meet other adopting/foster families in the community. All families are welcome to join us for a fun summer BBQ/Potluck at Woodward park. Meet at Woodward at 4:30pm. There will be games and tournaments.